If the 2016 Oklahoma football team does what media expect it to, come December, the Sooners will own their 10th Big 12 title under head coach Bob Stoops. OU was the runaway pick to win this year's league championship in a preseason media poll released by the conference office Thursday morning. The Sooners garnered 24 of 26 first-place votes in the poll and tallied 258 points. TCU picked up the other two first-place votes and totaled 222 points. Oklahoma State (202 points) was picked third and was followed by Baylor (156), Texas (151), Texas Tech (141), West Virginia (126), Kansas State (88), Iowa State (59) and Kansas (27). 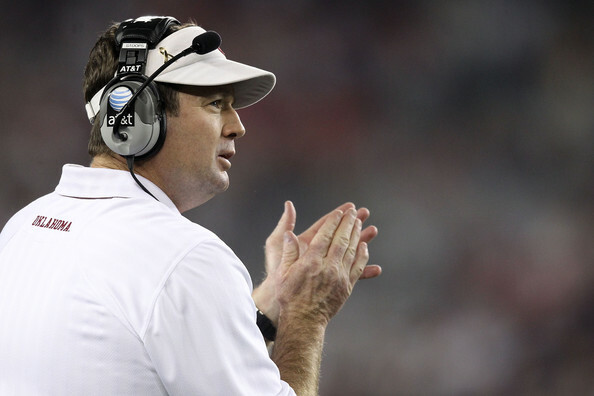 Stoops, who is getting ready to start his 18th season in Norman, has led OU to Big 12 titles in 2000, 2002, 2004, 2006, 2007, 2008, 2010, 2012 and last season. No other program has won more than two Big 12 titles during Stoops' tenure. The Sooners return 13 starters from last year's 11-2 team that went 8-1 in the Big 12 and became the league's first program to be selected for the four-team College Football Playoff. Seven offensive starters are back in the fold, including 2015 Big 12 Offensive Player of the Year Baker Mayfield, and six starters return on defense. That doesn't include punter and placekicker Austin Seibert. OU welcomes back 92 percent of its total offensive yards from last season and 63 percent of its tackles. Nine Sooners were named to the Preseason All-Big 12 Team on Wednesday. They are Mayfield, who was Sporting News' national player of the year last season, Seibert, receiver Mark Andrews, offensive tackle Orlando Brown, linebacker Jordan Evans, defensive back Steven Parker, running back Samaje Perine, defensive back Jordan Thomas and defensive lineman Charles Walker. Oklahoma opens the 2016 season Sept. 3 against Houston in the AdvoCare Texas Kickoff at NRG Stadium in Houston, Texas. The Sooners open the home season Sept. 10 against ULM in a renovated Gaylord Family - Oklahoma Memorial Stadium.